1The Director, Directorate of Research and Studies, Directorate General of Planning, Ministry of Health, PO Box 393, PC 113, Muscat, Sultanate of Oman. 2Senior Consultant Immunologist, Division of Human Immunology, Institute of Medical and Veterinary Science (IMVS), Hanson Institute, Frome road, Adelaide, SA, PO Box 14 Rundle Mall, Adelaide SA 5000, Australia. 3Current Chairperson of the Clinical Executive Team, Division of Haematology, Cancer Centre, Royal Adelaide Hospital, North Terrace, Adelaide 5000. *Address correspondence and reprints request to: Adhra Al-Mawali, The Director, Directorate of Research and Studies, Directorate General of Planning, Ministry of Health, PO Box 393, PC 113, Muscat, Sultanate of Oman. Al-Mawali A, Gillis D, Lewis I. Characteristics and Prognosis of Adult Acute Myeloid Leukemia with Internal Tandem Duplication in the FLT3 Gene. Oman Med J 2013 Nov; 28(6):432-440. Objectives: Constitutive activation of the fms-like tyrosine kinase 3 (FLT3) receptor by internal tandem duplication (ITD) of the juxtamembrane region has been described in patients with acute myeloid leukemia. FLT3/ITDs are present in about 20-30% of all acute myeloid leukemia cases. It has been shown that the mutation is correlated with worse prognosis. However, none of the previous studies investigated which FAB subtype is associated with higher percentage of FLT3/ITD, thus the reason for undertaking the current study. Methods: The prevalence and the potential prognostic impact of FLT3 mutations in 39 acute myeloid leukemia patients were analyzed by genomic polymerase chain reaction. Twelve samples with FLT3/ITDs and 27 acute myeloid leukemia samples without the mutations were compared with respect to clinical prognosis and FAB subtype. Results were correlated with cytogenetic data and the clinical response. Results: FLT3/ITD mutations were found in 31% of patients. FLT3/ITD was associated with similar clinical characteristics and was more prevalent in patients with normal karyotype (83%). Interestingly, half of the FLT3/ITD aberrations were found in patients with FAB M1 (50%), and fewer were found in patients with FAB M2 (8%), M4 (8%), and M5 (8%). Although less frequent in patients with cytogenetic aberrations, FLT3/ITDs were found in 17% of patients with t(15;17). Although the study was powered to 80%, patients with FLT3/ITD mutation did not show shorter complete remission duration or a higher relapse rate. Conclusion: The data confirm that FLT3/ITD mutations represent a common alteration in adult acute myeloid leukemia, mainly with normal karyotype (83%) and de novo acute myeloid leukemia (75%), as compared to secondary acute myeloid leukemia (25%) (p<0.001). It also showed that half of the M1-FAB subtype is FLT3/ITD positive. Therefore, FLT3/ITD is a therapeutic target, and thus inhibition of FLT3 tyrosine kinase activity may provide a new approach in the treatment of leukemia carrying these mutations. Keywords: Acute Myeloid Leukemia; M1; FLT3 gene; Tandem duplication; Prognosis. The fms-like tyrosine kinase 3 (FLT3), also known as stem cell tyrosine kinase-1 (STK1) or fetal liver tyrosine kinase-2 (FLK-2), belongs to the group of class III receptor tyrosine kinases (RTKs), which also include the receptors c-kit and c-fms.1 Signals generated by ligand-induced dimerization of these receptors involve tyrosine phosphorylation of certain regions of the receptor and activation of cellular tyrosine kinases. Whilst a large proportion of acute myeloid leukemia (AML) have been found to express class III RTKs,2-5 their potential role in leukemia is still unclear. Figure 1: Overview of the FLT3 monomer spanning the plasma membrane. In 1996, Nakao et al.6 were the first to report a novel mutation in the FLT3 gene in a small number of AML patients. These mutations were shown to be internal tandem duplication (ITDs), mainly involving a tyrosine rich stretch at the end of exon 14 (587-NEYFYVDFREYEYD-560), coding for the juxtamembrane (JM) domain of the receptor (Fig. 1, overview of the FLT3 gene). In addition, some ITDs involving exon 15 have been published.7 All ITDs were in frame and resulted in an elongated JM domain. Fig. 1 represents the 5 extracellular Ig-like domains (Ig1-5) in the ligand binding domain of the extracellular part of the receptor (ECD), the transmembrane domain (TM), the JM and the two intracellular tyrosine kinase domains (TK1 and TK2) separated by the kinase insert (KI). The positions of the two known types of mutations involved in AML, i.e., internal tandem duplications (ITDs) in the JM domain and point mutations in the KI, are indicated. Of each type of mutation, some examples are presented. ITDs have been reported in the part of the FLT3 gene coding for the JM through first tyrosine kinase (TK-1) domains of the protein in 17-20% of Japanese AML patients,8 and Western-European population,9 as well as in patients with leukemic transformation of myelodysplasia.10,11 This type of mutation has not been found in acute lymphoblastic leukemia (ALL), chronic myelocytic leukemia (CML), blast crisis CML, or in normal individuals. Kiyoi et al.10 have shown that in COS-cells, transduced with cDNA encoding for FLT3/ITDs, elongation of the JM domain and ligand-independent dimerization of the mutant receptor occurs, resulting in a constitutive activation. This effect was seen in both mutant/mutant and in mutant/wildtype (WT) dimers of the receptor. Kelly et al.12 showed that the introduction of FLT3/ITDs into a murine bone marrow (BM) transplant model resulted in a myeloproliferative phenotype characterized by leukocytosis and splenomegaly with extramedullary hemopoiesis in spleen and liver. As these ITDs were insufficient to induce leukemia in this model, the data suggests that other co-operating mutations are necessary for the development of a leukemic phenotype. This study aims to determine the incidence of FLT3/ITD mutation in AML patients and assess its prognostic significance. Genomic DNA from fresh bone marrow (BM) of 39 consecutive, unselected patients with AML was obtained at diagnosis at the Royal Adelaide Hospital, Adelaide, South Australia. The study design was approved by the Royal Adelaide Hospital Research Ethics Committee prior to its initiation. The diagnoses were based on morphologic findings, immunophenotyping and cytogenetics.13 In addition, follow-up samples were obtained at 2 to 5 time points from 10 patients carrying the FLT3 mutation. Exons 14 to 15 of the FLT3 gene were amplified by genomic polymerase chain reaction (PCR). The FLT3/ITD amplification yielded a higher molecular weight product (higher band) on a 2% agarose gel stained with ethidium bromide (Fig. 2), compared to the wildtype control (lower band). Of the 39 samples analyzed, 12 (31%) revealed FLT3/ITD. The size of the FLT3/ITD varied from approximately 21 base pairs (bp) to more than 150 bp and comprised different parts of the JM domain. Of the 12 patients with FLT3/ITD, 10 (83%) had a normal karyotype, similar to other reports.14 In most of the FLT3/ITD positive patients, the mutation was present as a heterozygous mutation, but in 1 case the ITD appeared as a single aberrant band on gel, indicating the presence of either a homozygous mutation or, more likely, a hemizygous deletion of the WT gene. 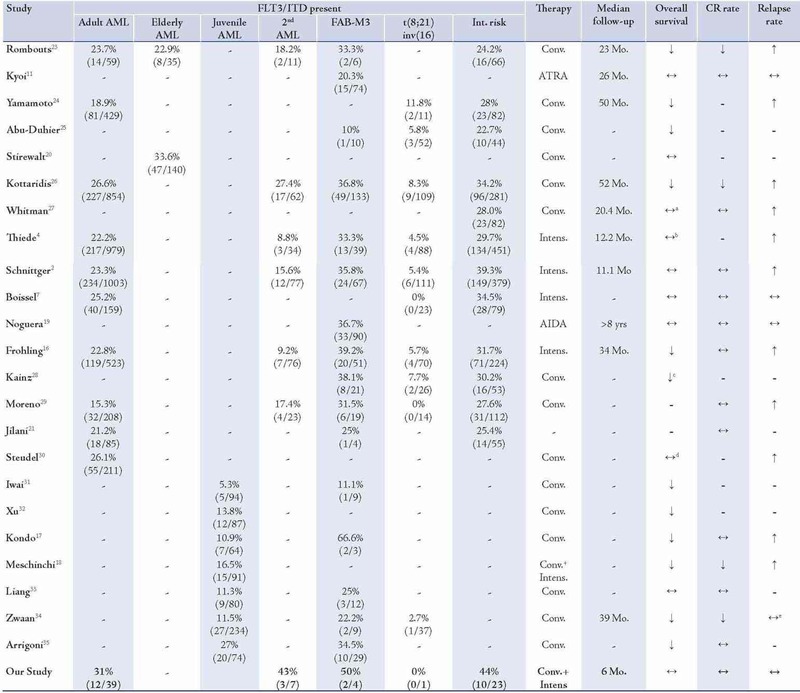 The characteristics of the 12 AML patients with the mutation and 27 AML patients without such a mutation included in this study are shown in Table 2. Sequence analysis from two patients of the FLT3 mutant samples (Table 3), confirmed the presence of tandem duplication of different sizes (33bp and 78bp). Figure 2: Genomic PCR for the FLT3/ITD. Genomic DNA prepared from diagnostic marrow specimens were PCR amplified and resolved on 2% agarose gel electrophoresis and visualised under UV light. A) Lane 12: no DNA, Lanes 13 and 14: positive and negative controls, M: marker pUC19, Lanes 1-11, samples from 11 different adult AML patients. High-molecular weight bands in lanes 4, 6, 7, 9 and 10 represent FLT3/ITD. The solid arrow points to the normal FLT3 gene product while the dotted arrow points to the FLT3/ITD mutation which varied in length (number of bp inserted) between the five positive patients. B) Lane 1-5, samples from 5 different adult AML patients. Patients sample in lane 3 do not have a normal FLT3 band. The purification of DNA was done using QIAmp® Kits (QIAamp® Blood Kit - QIAGEN Cat No. 51106 [250 tests] or Cat No. 51104 [50 tests]). After purification of the target DNA, samples were electrophoresed and stained with ethidium bromide. The gel was then scanned on the Geldoc system. DNA concentration was determined by measuring the absorbency of a DNA preparation at 260 nm on a NanoDrop ND-1000 spectrophotometer. DNA was separated by electrophoresis on agarose gel (DNA grade, Progen) made in 1× Tris-Borate-EDTA (TBE) with the percentage of the gel dependent on the size of the DNA products to be detected. The size of DNA fragments was calculated by comparing their relative mobilities in agarose with DNA of a known size. The commercially available molecular weight marker used was pUC19 DNA. Table 1 summarizes the location of the oligonucleotide primers used to sequence or amplify FLT3. The location of these oligonucleotide primers was based on the FLT3 sequence published by Nakao et al.6 All reagents were aliquoted using non-aerosol tips in order to reduce contamination. Reactions were prepared in 0.5 ml microcentrifuge tubes to a final volume of 25 μl. 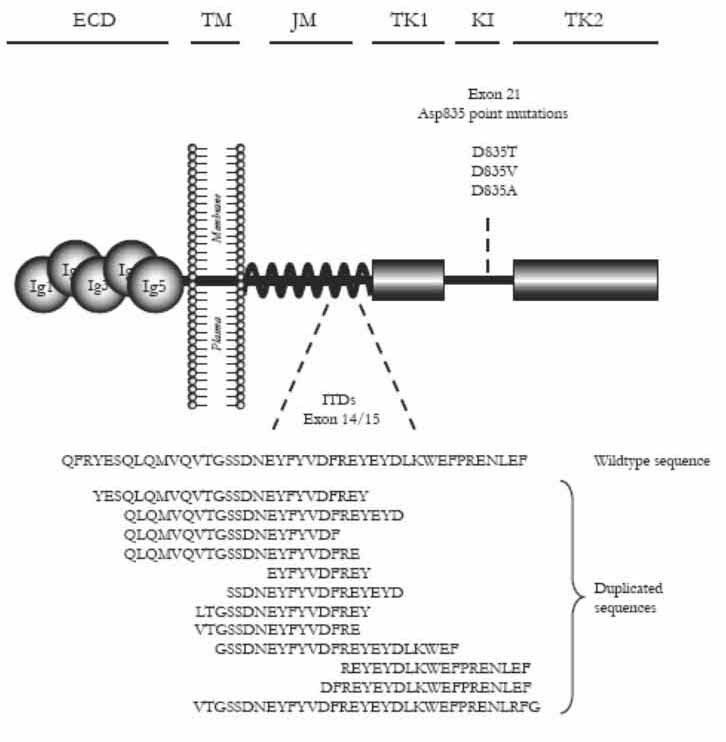 For amplification of DNA, reactions containing 1.25 ng DNA (10 μl), 2 ng/µl each of forward and reverse primers (0.5 μl), 0.2 mM dNTPs (2.5 μl), 1.5 mM MgCl2 (1.5 μl), Taq buffer (2.5 μl), Taq Gold polymerase (0.25 μl) made to the final volume with sterile Milli-Q water (7.25 μl) were prepared. DNA was amplified using a DNA Thermal Cycler (Eppendorf Mastercycler) with an initial 7 minutes denaturation step at 94ºC, followed by 35 cycles (1 minute) of denaturation, primer annealing (62oC), and elongation (72ºC), finishing with a final extension at 72ºC for 7 minutes. Completed reactions were stored at 4ºC. The samples from the PCR product were purified and then submitted to the Institute of Medical and Veterinary Science sequencing facility, Molecular Pathology, for analysis on an automated sequencing system (a Perkin Elmer automated sequencer), which uses capillary electrophoresis system to separate the oligonucleotide products, and fluorescence was also monitored. Relapse free survival (RFS) was measured from the date of complete remission (CR) to the date of relapse or else from the date of CR to the last follow-up date, if relapse had not occurred. Overall survival (OS) was measured from the date of diagnosis to the date of death, or else from the date of diagnosis to the last follow-up date if death had not occurred. All analyses were done using R, R Development Core Team (2007). R: A language and environment for statistical computing. R Foundation for statistical Computing, Vienna, Austria.15 ISBN 3-900051-07-0, URL http://www.R-project.org. This study attempted to determine the clinical response and prognosis of AML patients with and without FLT3/ITD. Twenty-seven patients were evaluated for their initial response to therapy. There was a tendency for patients with FLT3/ITD not to achieve CR when compared to patients in the population without FLT3/ITDs (7/10 vs. 15/17), [Table 2]. A larger sample size may have led to a greater difference in remission rates. At a median follow-up period of 10 months in the group with ITDs, 3 of the 7 (43%) patients who had achieved CR had relapsed, whilst 8 out of 15 (53%) patients without ITDs had relapsed (p=0.6). Table 2: Patient clinical characteristics. Table 3: Sequence analysis of the FLT3/ITDs in 2 patients. The bold base pairs (bp) are not part of FLT3 gene. The median age of patients with FLT3/ITD was 62 years vs. 69 years in the group without the mutation. As shown in Table 2, the mutation was more frequent in men than in women, with a 2:1 ratio. The group with FLT3/ITD showed no statistically significant difference (p>0.05; Likelihood ratio test, 95% CI) in the current series with respect to RFS (Fig. 3A) and OS (Fig. 3B), as compared to the group without the mutation. Details for the RFS and OS of the population with FLT3 mutations are shown in Table 4. Since the heterogeneity of our AML population impacted our analysis, we also looked at the RFS and OS for the two largest sub-populations that could be distinguished within our dataset, i.e., patients with de novo AML (Fig. 3D), and patients with an intermediate-risk karyotype. Although secondary AML showed shorter OS, this was not statistically significant (p=0.07; Likelihood ratio test, 95% CI), and neither in the group of patients with an intermediate cytogenetic risk and FLT3 mutation. Age is known to be an important prognostic factor, and thus the samples were divided into two groups according to age (Fig. 3C). In both age groups (under 60 years and over 60 years), the difference with respect to OS was significant in univariate analysis (p=0.043; Likelihood ratio test, 95% CI). Other known potential confounders (i.e., WBC, FAB subtypes, cytogenetics, percentage of blasts at diagnosis) were also investigated and were all not found to be statistically significant with respect to OS (p>0.05; Likelihood ratio test, 95% CI). 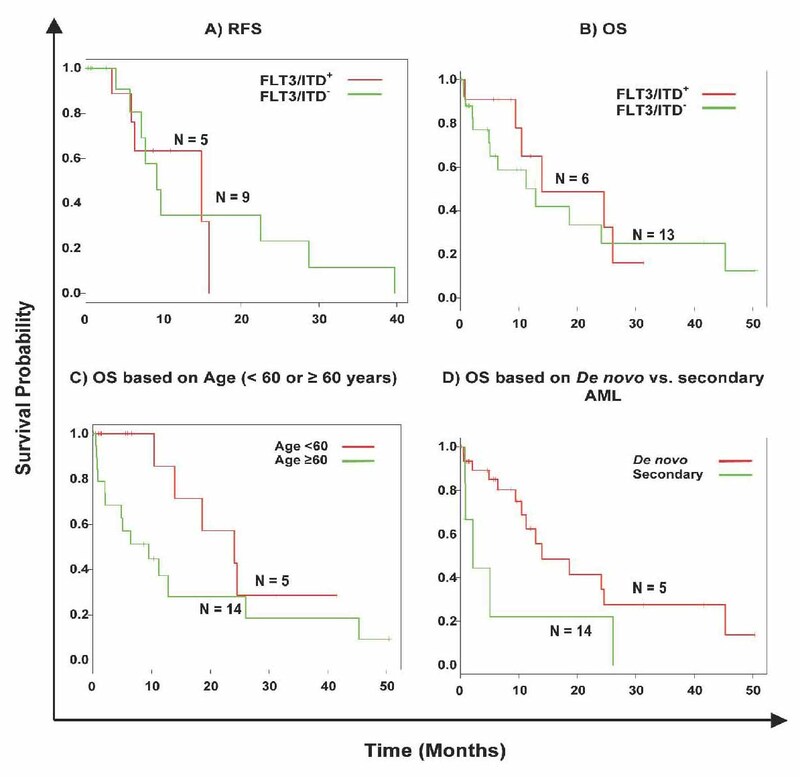 Figure 3: Kaplan-Meier survival curves of the effect of FLT3/ITDs in AML. Green lines, FLT3/ITD negative samples, red lines FLT3/ITD positive population. Censored cases are marked by a dash. (A) Cumulative RFS of all cases investigated, 13 cases were deleted from the analysis due to "no treatment"; (B) cumulative OS of all cases investigated. (C) OS in patients with and without FLT3/ITD in patients with an age below 60 years and those older or equal to 60 years. (D) OS in patients with and without FLT3/ITD in patients with de novo vs. secondary AML. Table 4: Kaplan-Meier survival table of the RFS and OS of the AML patients with FLT3/ITDs. Evaluation of prognostic factors including cytogenetics, age, WBC count at diagnosis, percentage of blasts at diagnosis, and secondary etiology of AML as covariates using multivariate analysis showed that the FLT3/ITD state is not an independent prognostic factor for OS or RFS. Cytogenetic analyses were available from 38 analyzed patients. They were grouped into 3 categories according to cytogenetics: favorable group (n=6); intermediate group (n=23); and poor group (n=9). However, one patient was not analyzed due to insufficient sample received. Ordinal χ2 analysis showed that FLT3/ITD was not randomly distributed within cytogenetic subgroups (p<0.001). Of the 12 patients with FLT3/ITD, 10 (83%) had a normal karyotype (Table 2). This was more than in the group without the mutation, where only 13 of 27 (48%) were cytogenetically normal (p=0.07). The mutation was most common in the normal karyotype group and in the t(15;17) favorable group (17%). In contrast, compared with the total cohort, FLT3/ITD was not found in patients with t(8;21), 11q23 translocations, -5, del(5q), -7, del(7q) and complex rearrangements. The mutation was also not detected in the 2 patients with inv (16)/ t(16;16) in our cohort. FLT3/ITD was significantly more common in patients with de novo AML (75%) compared to patients with secondary AML (25%; p≤0.001), (Table 2). The incidence of FLT3/ITD according to karyotype was ranked as follows: normal karyotype (83%) > t(15;17) [17%] > complex karyotype (0%). In terms of the correlation between leukocyte count and FAB subgroups, it was observed that in 39 patients, the leukocyte count was higher in the group with the FLT3/ITD than in the group without the mutation (median WBC: 6.6 vs. 6.3), respectively. While the correlation with regards to the percentage of blasts at diagnosis showed that for 39 patients, the blast percentage count was higher in the FLT3/ITD group than in the group without the mutation (median blasts %: 72 vs. 35), respectively. 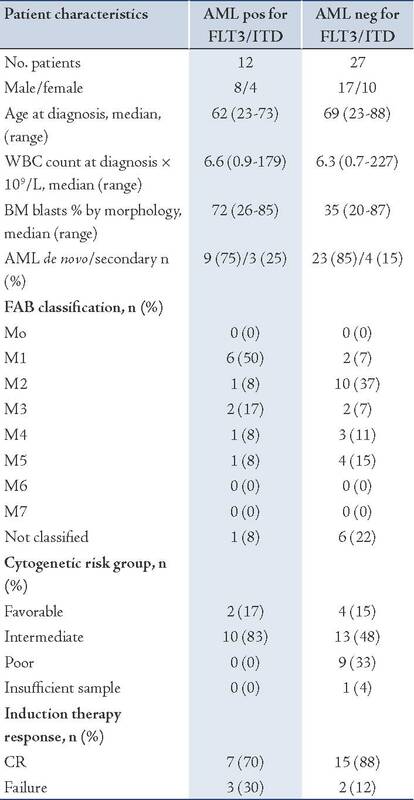 The correlation with FAB subtype was seen in 32 patients, in which FAB classification was available. Fifty percent of FLT3/ITD positive was M1 (Table 2). The incidence of FLT3/ITD was ranked as follows: M1 (50%) > M3 (17%) > M2 (8%), M4 (8%), M5 (8%) > M0 (0%), M6 (0%), M7 (0%). No patient was positive for the ITD in M0, M6 or M7. However, patients with M6 or M7 were encountered only as small groups in the prospective study and thus no definite conclusion is possible for these subtypes. To date, over 20 studies in total comprising over 5000 patients have been published investigating the incidence and clinical implications of FLT3/ITDs in adult or pediatric AML. Many of the studies were retrospective studies using banked leukemia samples. Using stored samples, one would expect to induce a bias for samples with high WBC counts or BM cellularity. As most studies indicate FLT3/ITDs to be linked with high WBC counts,7,16-20 one expects the incidence rates to be somewhat over estimated, as illustrated in Table 2. Incidence rates in the studies can also be influenced by source material (peripheral blood, BM or plasma DN),21,22 or the techniques used to amplify and detect the FLT3 mutations. Most of the studies were based on PCR amplification of genomic DNA or RNA, followed by simple agarose gel electrophoresis.4,6,19 Whilst, others use a single strand conformation polymorphism analysis,20 to detect mutations which may not be detected in the standard gel electrophoresis. So far with regard to the incidence of FLT3/ITDs, several features are evident from the studies described in Table 5. First, the incidence of FLT3/ITDs is increased in patients with FAB-M3 and patients with intermediate risk cytogenetics. On the other hand, the incidence is decreased in patients with t(8;21) or inv(16), the so-called core binding factor (CBF) leukemias. Second, the incidence of the mutations in juvenile AML is reduced when compared to adult AML. However, 4 of the 6 studies involving juvenile AML have reported FLT3/ITD mutations to increase with age.17,18,33,34 This is in contrast to adult AML, where only one study reported an increasing incidence of FLT3/ITD with age.2 Though FLT3 mutations are clearly more common in FAB-M3, they otherwise appear to be very evenly distributed over all other FAB classes. Nevertheless, some studies do report significant differences in the incidence within certain FAB classes.2,4,34 However, as these studies indicate different FAB classes to be involved, they are most likely caused by biases in the sampled populations. Taken together from the data in Table 5, the occurrence of FLT3/ITDs can be estimated to be around 20% in adult AML (30% for the intermediate risk population) and around 14% in childhood leukemia. The overall incidence of FLT3/ITD mutations in our study was 31% (12 out of 39), which is consistent with numbers reported by other groups.6 This high incidence indicates that FLT3 is an important target of mutational activation in adult AML. Table 5: Occurrence and prognostic impact of FLT3/ITDs in AML. a OS is significantly reduced in patients with deletions of the wildtype gene. ↓ = Decreased; b OS is significantly reduced in patients with a high mutant to wildtype ratio. ↔ = No effect; c OS is significantly reduced in patients with intermediate risk cytogenetics. ↑ = Increased; d OS is significantly reduced in patients with a high mutant to wildtype ratio; e relapse rates are increased in patients with a high mutant to wildtype ratio. When only patients of cytogenetic intermediate prognostic risk were analyzed, FLT3/ITDs had a clearly negative impact on OS.28 The two remaining studies, which failed to detect any effect of FLT3/ITDs on OS, both involved an intensified conditioning regimen.2,7 It should be noted that while the median follow-up in the study by Boissel et al. is unknown, the study by Schnittger et al. only had a median follow-up of 11.1 months, which might have been too early to detect differences in OS. Differences might also be attributed to the assessment of FLT3/ITDs. Only the study by Stirewalt et al.20 specifically investigated the prognostic impact of FLT3/ITDs in elderly AML. Most other studies involved pediatric patients. This one study failed to detect an effect of FLT3/ITDs in elderly patients. However, the median OS for seven months in the older age population may have obscured a possible negative impact of these mutations in elderly patients. The majority of the published studies so far indicate the presence of FLT3/ITDs to be a significant and independent predictor of an unfavorable clinical response. Yet, since many studies have focused on specific subgroups of AML patients and the duration of the follow-up is quite heterogeneous, it is difficult to directly compare the overall prognostic impact. With an occurrence of around 20% in adult AML and 30% in the normal karyotype, FLT3-mutations are to date the most frequent genetic mutations observed in AML. Although the mechanism by which mutations in the FLT3 gene influence patient prognosis is unresolved, it is clear that AML with FLT3/ITDs represent a subset of leukaemia with a poor prognosis. The authors reported no conflict of interest, and would like to thank The Research Council of Oman (TRC) for supporting the continuation of this project by awarding a grant (TRC Grant Number 47). 1. Gilliland DG, Jordan CT, Felix CA. The molecular basis of leukemia. Hematology Am Soc Hematol Educ Program 2004;80-97. 2. Schnittger S, Schoch C, Dugas M, Kern W, Staib P, Wuchter C, et al. Analysis of FLT3 length mutations in 1003 patients with acute myeloid leukemia: correlation to cytogenetics, FAB subtype, and prognosis in the AMLCG study and usefulness as a marker for the detection of minimal residual disease. Blood 2002 Jul;100(1):59-66. 3. Schnittger S, Schoch C, Kern W, Hiddemann W, Haferlach T. FLT3 length mutations as marker for follow-up studies in acute myeloid leukaemia. Acta Haematol 2004;112(1-2):68-78. 4. Thiede C, Steudel C, Mohr B, Schaich M, Schäkel U, Platzbecker U, et al. Analysis of FLT3-activating mutations in 979 patients with acute myelogenous leukemia: association with FAB subtypes and identification of subgroups with poor prognosis. Blood 2002 Jun;99(12):4326-4335. 5. Wang L, Lin D, Zhang X, Chen S, Wang M, Wang J. Analysis of FLT3 internal tandem duplication and D835 mutations in Chinese acute leukemia patients. Leuk Res 2005 Dec;29(12):1393-1398. 6. Nakao M, Yokota S, Iwai T, Kaneko H, Horiike S, Kashima K, et al. Internal tandem duplication of the flt3 gene found in acute myeloid leukemia. Leukemia 1996 Dec;10(12):1911-1918. 7. Boissel N, Cayuela JM, Preudhomme C, Thomas X, Grardel N, Fund X, et al. Prognostic significance of FLT3 internal tandem repeat in patients with de novo acute myeloid leukemia treated with reinforced courses of chemotherapy. Leukemia 2002 Sep;16(9):1699-1704. 8. Yokota S, Kiyoi H, Nakao M, Iwai T, Misawa S, Okuda T, et al. Internal tandem duplication of the FLT3 gene is preferentially seen in acute myeloid leukemia and myelodysplastic syndrome among various hematological malignancies. A study on a large series of patients and cell lines. Leukemia 1997 Oct;11(10):1605-1609. 9. Horiike S, Yokota S, Nakao M, Iwai T, Sasai Y, Kaneko H, et al. Tandem duplications of the FLT3 receptor gene are associated with leukemic transformation of myelodysplasia. Leukemia 1997 Sep;11(9):1442-1446. 10. Kiyoi H, Naoe T. FLT3 mutations in acute myeloid leukemia. Methods Mol Med 2006;125:189-197. 11. Kiyoi H, Naoe T, Yokota S, Nakao M, Minami S, Kuriyama K, et al; Leukemia Study Group of the Ministry of Health and Welfare (Kohseisho). Internal tandem duplication of FLT3 associated with leukocytosis in acute promyelocytic leukemia. Leukemia 1997 Sep;11(9):1447-1452. 12. Kelly LM, Liu Q, Kutok JL, Williams IR, Boulton CL, Gilliland DG. FLT3 internal tandem duplication mutations associated with human acute myeloid leukemias induce myeloproliferative disease in a murine bone marrow transplant model. Blood 2002 Jan;99(1):310-318. 13. Löwenberg B, Downing JR, Burnett A. Acute myeloid leukemia. N Engl J Med 1999 Sep;341(14):1051-1062. 14. Rombouts WJ, Broyl A, Martens AC, Slater R, Ploemacher RE. Human acute myeloid leukemia cells with internal tandem duplications in the Flt3 gene show reduced proliferative ability in stroma supported long-term cultures. Leukemia 1999 Jul;13(7):1071-1078. 15. Core TR. A language and environment for statistical computing. R Foundation for Statistical Computing 2007;Vienna, Austria. 16. Fröhling S, Schlenk RF, Breitruck J, Benner A, Kreitmeier S, Tobis K, et al; AML Study Group Ulm. Acute myeloid leukemia. Prognostic significance of activating FLT3 mutations in younger adults (16 to 60 years) with acute myeloid leukemia and normal cytogenetics: a study of the AML Study Group Ulm Blood 2002 Dec;100(13):4372-4380. 17. Kondo M, Horibe K, Takahashi Y, Matsumoto K, Fukuda M, Inaba J, et al. Prognostic value of internal tandem duplication of the FLT3 gene in childhood acute myelogenous leukemia. Med Pediatr Oncol 1999 Dec;33(6):525-529. 18. Meshinchi S, Woods WG, Stirewalt DL, Sweetser DA, Buckley JD, Tjoa TK, et al. Prevalence and prognostic significance of Flt3 internal tandem duplication in pediatric acute myeloid leukemia. Blood 2001 Jan;97(1):89-94. 19. Noguera NI, Breccia M, Divona M, Diverio D, Costa V, De Santis S, et al. Alterations of the FLT3 gene in acute promyelocytic leukemia: association with diagnostic characteristics and analysis of clinical outcome in patients treated with the Italian AIDA protocol. Leukemia 2002 Nov;16(11):2185-2189. 20. Stirewalt DL, Kopecky KJ, Meshinchi S, Appelbaum FR, Slovak ML, Willman CL, et al. FLT3, RAS, and TP53 mutations in elderly patients with acute myeloid leukemia. Blood 2001 Jun;97(11):3589-3595. 21. Jilani I, Estey E, Manshuri T, Caligiuri M, Keating M, Giles F, et al. Better detection of FLT3 internal tandem duplication using peripheral blood plasma DNA. Leukemia 2003 Jan;17(1):114-119. 22. Al Huneini M, Wasim F, Al Farsi K, Al-Khabori M, Al Kindi S. Genital ulcer development in patients with acute promyelocytic leukaemia treated with all-trans retinoic Acid: a case series. Oman Med J 2013 May;28(3):207-209. 23. Rombouts WJ, Blokland I, Löwenberg B, Ploemacher RE. Biological characteristics and prognosis of adult acute myeloid leukemia with internal tandem duplications in the Flt3 gene. Leukemia 2000 Apr;14(4):675-683. 24. Yamamoto Y, Kiyoi H, Nakano Y, Suzuki R, Kodera Y, Miyawaki S, et al. Activating mutation of D835 within the activation loop of FLT3 in human hematologic malignancies. Blood 2001 Apr;97(8):2434-2439. 25. Abu-Duhier FM, Goodeve AC, Wilson GA, Gari MA, Peake IR, Rees DC, et al. FLT3 internal tandem duplication mutations in adult acute myeloid leukaemia define a high-risk group. Br J Haematol 2000 Oct;111(1):190-195. 26. Kottaridis PD, Gale RE, Frew ME, Harrison G, Langabeer SE, Belton AA, et al. The presence of a FLT3 internal tandem duplication in patients with acute myeloid leukemia (AML) adds important prognostic information to cytogenetic risk group and response to the first cycle of chemotherapy: analysis of 854 patients from the United Kingdom Medical Research Council AML 10 and 12 trials. Blood 2001 Sep;98(6):1752-1759. 27. Whitman SP, Archer KJ, Feng L, Baldus C, Becknell B, Carlson BD, et al. Absence of the wild-type allele predicts poor prognosis in adult de novo acute myeloid leukemia with normal cytogenetics and the internal tandem duplication of FLT3: a cancer and leukemia group B study. Cancer Res 2001 Oct;61(19):7233-7239. 28. Kainz B, Heintel D, Marculescu R, Schwarzinger I, Sperr W, Le T, et al. Variable prognostic value of FLT3 internal tandem duplications in patients with de novo AML and a normal karyotype, t(15;17), t(8;21) or inv(16). Hematol J 2002;3(6):283-289. 29. Moreno I, Martín G, Bolufer P, Barragán E, Rueda E, Román J, et al. Incidence and prognostic value of FLT3 internal tandem duplication and D835 mutations in acute myeloid leukemia. Haematologica 2003 Jan;88(1):19-24. 30. Steudel C, Wermke M, Schaich M, Schäkel U, Illmer T, Ehninger G, et al. Comparative analysis of MLL partial tandem duplication and FLT3 internal tandem duplication mutations in 956 adult patients with acute myeloid leukemia. Genes Chromosomes Cancer 2003 Jul;37(3):237-251. 31. Iwai T, Yokota S, Nakao M, Okamoto T, Taniwaki M, Onodera N, et al. Internal tandem duplication of the FLT3 gene and clinical evaluation in childhood acute myeloid leukemia. The Children’s Cancer and Leukemia Study Group, Japan. Leukemia 1999 Jan;13(1):38-43. 32. Xu F, Taki T, Yang HW, Hanada R, Hongo T, Ohnishi H, et al. Tandem duplication of the FLT3 gene is found in acute lymphoblastic leukaemia as well as acute myeloid leukaemia but not in myelodysplastic syndrome or juvenile chronic myelogenous leukaemia in children. Br J Haematol 1999 Apr;105(1):155-162. 33. Liang DC, Shih LY, Hung IJ, Yang CP, Chen SH, Jaing TH, et al. Clinical relevance of internal tandem duplication of the FLT3 gene in childhood acute myeloid leukemia. Cancer 2002 Jun;94(12):3292-3298. 34. Zwaan CM, Meshinchi S, Radich JP, Veerman AJ, Huismans DR, Munske L, et al. FLT3 internal tandem duplication in 234 children with acute myeloid leukemia: prognostic significance and relation to cellular drug resistance. Blood 2003 Oct;102(7):2387-2394. 35. Arrigoni P, Beretta C, Silvestri D, Rossi V, Rizzari C, Valsecchi MG, et al. FLT3 internal tandem duplication in childhood acute myeloid leukaemia: association with hyperleucocytosis in acute promyelocytic leukaemia. Br J Haematol 2003 Jan;120(1):89-92.